A. Call for research proposal (annex 1). Chair should confirm that proposed new research proposal do not overlap with already approved proposal(s). Chair should assign two SC members to review the submitted research proposal (annex 2). Research proposals should be approved by majority vote according to the comments from reviewers, which means more than half of the representatives voted, and more than half agreed. The principal investigators of approved research proposals would be the research project leader, and BiCCA cohort(s) who join the research project become research project members. Each research project leader of approved research proposal should be responsible for variables collection, data management and analysis, and manuscript preparation. Executive period of each research project is 2 years after approval of proposal. During this period the first draft of manuscript should be completed. 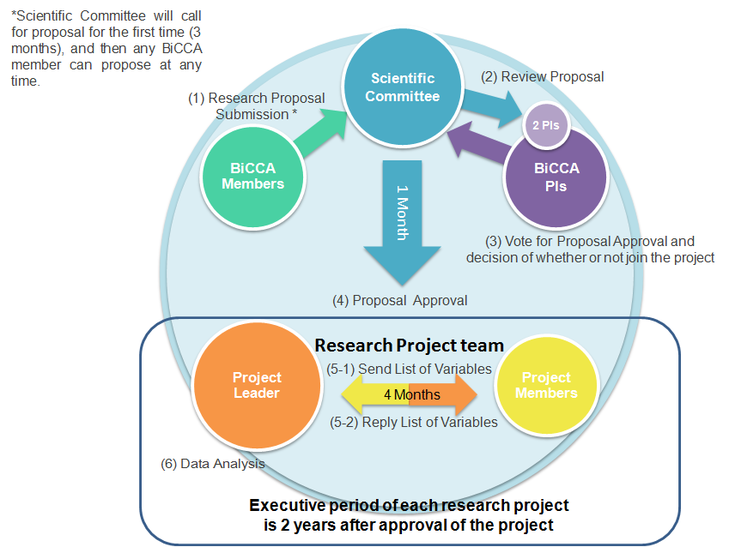 Otherwise, the research project will be released to other BiCCA members. Extension of executive period should be proposed and reviewed. The research project leader decides upon the first and corresponding authors. a. The writing team can include any number of authors if they meet 4 ICMJE criteria (annex 3). b. The research project leader is responsible to ensure enough space for other participating BiCCA authors. a. The numbers of delegate depend on cohort size, 2 for participants less than 1,000, 3 for those between 1,000 to 5,000 and 4for those more than 5000.
b. The order of these delegates would be placed according to the sequence of cohort size. Acknowledgement to BiCCA for providing a collaboration platform would be appreciated if 3 or more BiCCA member joined the project. For unapproved research projects, private cooperation without name of BiCCA is allowed. Submission process and updated information of SC members will be announced on BiCCA website and renewed regularly.